I'm going to play a little bit of catch-up here. I've been sketching more than I can post, instead using my instagram feed for more up-to-date posting. In November I went south to the Los Angeles area and had a few days of sunshine and feasting with family and friends. Hollywood is packed with sketchable locations. 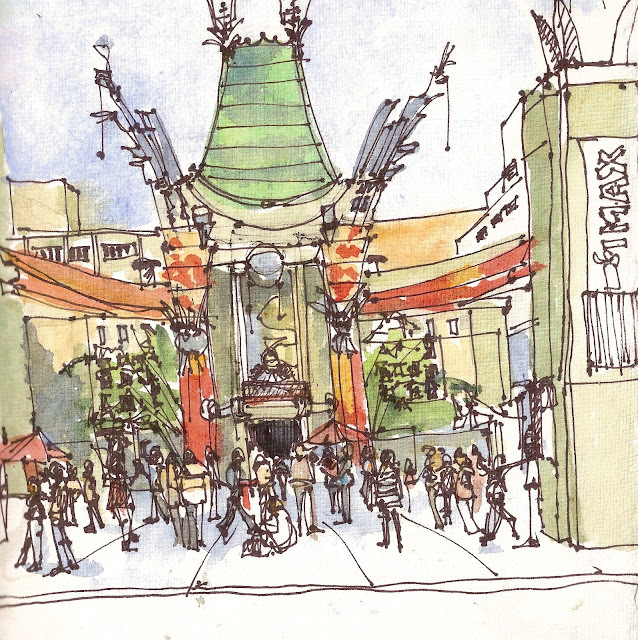 TCL Chinese Theater (formerly Grauman's Chinese Theater) is an essential landmark on the Avenue of the Stars. Apparently when it opened, a riot broke out as fans tried to catch a glimpse of their favorite celebrities. 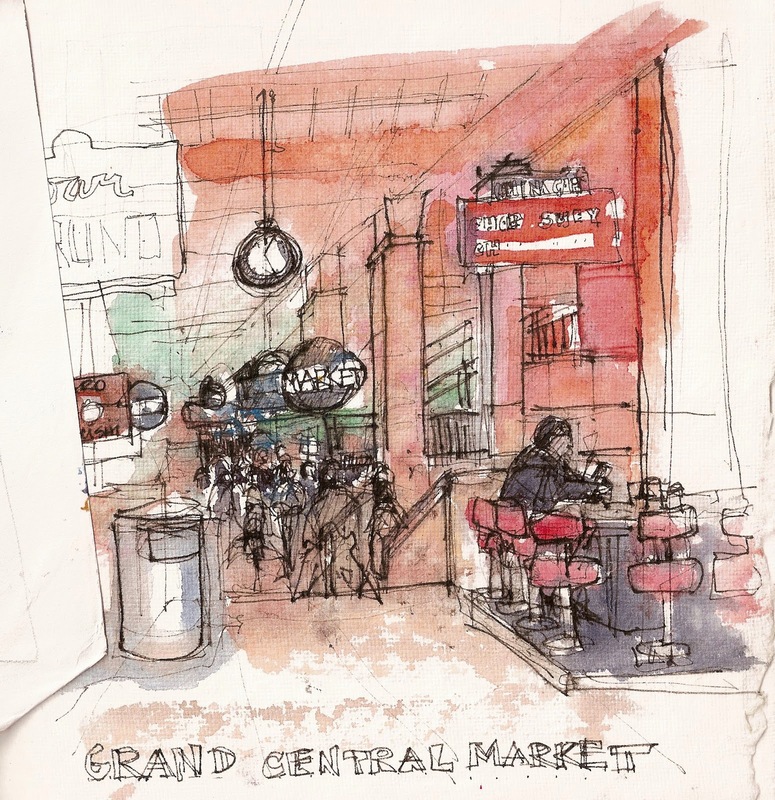 Grand Central Market sits comfortably in the former entertainment center of downtown LA. Built in 1917 it was the green grocer for the neighborhood residents. It was refurbished in 1984 and now hosts not only a patchwork of food vendors, but a varied menu of events: game night every Thursday, free concerts, holiday markets and more. 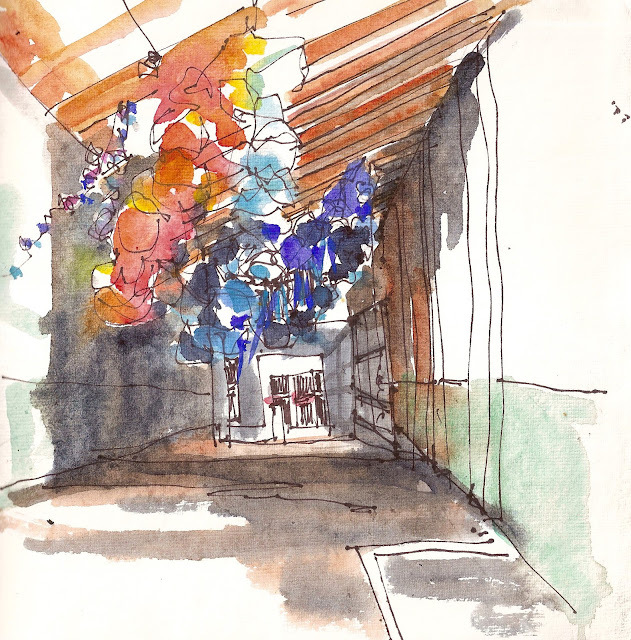 Shinique Smith's "Forgiving Strands" welcomes visitors at the rear entrance to Hauser, Wirth and Schimmel. This internationally known gallery of contemporary art took over a 100,000 sq ft flour mill in the downtown LA arts district. I loved this piece of bulbous fabric twists, stuffed, tied and looping through the hallway. The contrast of these lush, plump textiles and the stark, concrete hallway was a gift to my tactile sense. Iconic Santa Monic Beach - lifeguard stations and slack line artists walking their flat, slack tightropes, twisting their limbs to maintain balance - all makes for great sketching on the beach. 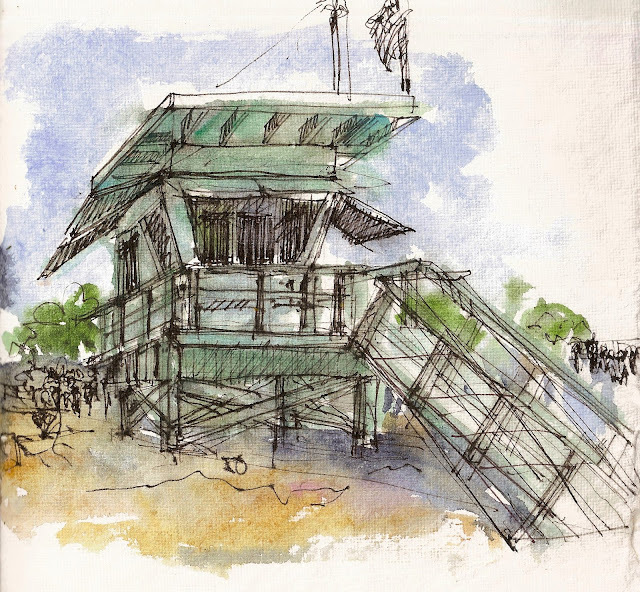 These lifeguard stations are surprising difficult to draw!